Chloe Feoranzo, a popular jazz musician, has returned to grace the NEIU’s Jewel Box stage with her beautiful clarinet. 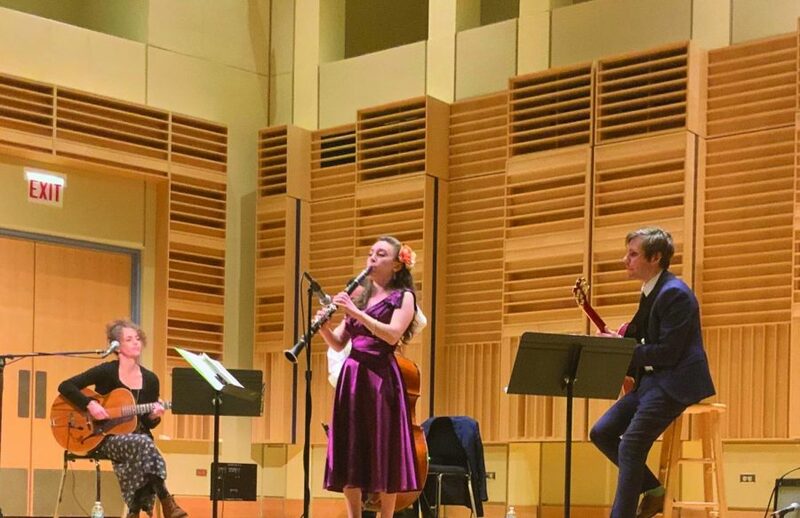 This is her second time performing on campus, but this time she was accompanied by three other musicians, Molly Teeves on vocals and acoustic Guitar, Nahum Zdybel on electric guitar and Ted Long on strong bass. The four musicians travelled to NEIU from their native New Orleans to perform on March 15. Their showcase, “A passion for New Orleans Traditional Jazz,” is one of the five performances in the Jewel Box Series, which opened its 19th season this past September. The series aims to bring talent, both local, national and international, to NEIU to perform in the Steinberg Fine Arts Center. The performance showcased a blend of instruments and vocals which was a joy to listen to. Feoranzo being the most well known, perhaps, has been performing professionally since the age of 15. She has performed at various California music festivals and completed a three year tour with the musician Pokey LaFarge. As part of the band, she has performed on different television shows including “The Late Show With David Letterman” and performed in history music venues including The Grand Ole Opry. During their performance, the band played “Baby I don’t cry over you” by Billy Joel as well as some of their originals. The performances had hands clapping and feet tapping with their beautiful sound and was a pleasure to watch as each musician played harmoniously.